This cake will be garnished on top with fresh cream, chocolate pieces and chocolate syrup as well as chocolate shavings on top. The designing using all the toppings may vary a little from the image shown. This rich chocolaty cake can satisfy the quench of any chocolate lover in the best way as it is a perfectly baked Rich Chocolate Cake that is also perfect as a gift or as a birthday surprise. You can buy this delicious chocolate cake with such attractive and elegant decoration from here in just few clicks. And, for that you simply need to place order for this delicious cake. 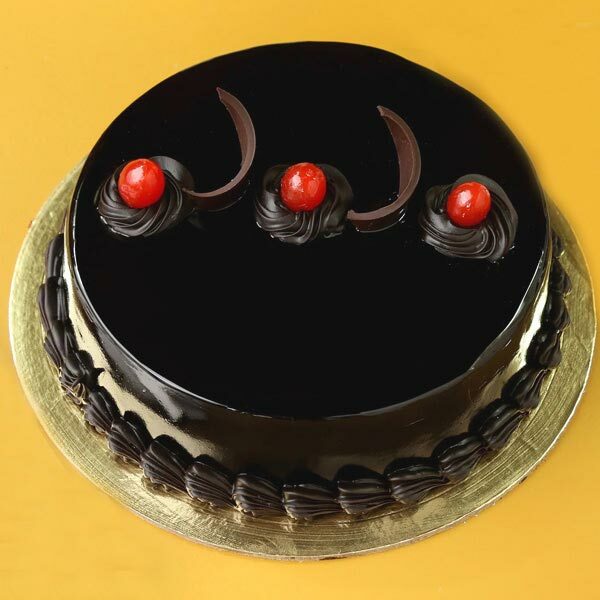 No wonder, every bite of this yummy chocolate cake will give a relishing time to your dear ones. Apart from the creamy topping and bread base the key ingredients of this cake are flour, powdered sugar, baking powder, chocolate, eggs, cherries for decoration and more. You can also opt for eggless version of this cake to enjoy celebrations and festivities.